The Middletown Township Human Rights Commission (HRC) has drafted a resolution seeking the reappointment of Carolyn Schwebel, its former chairwoman. At the commission's Jan. 24 meeting, members drafted a unanimous resolution in support of the reappointment of Schwebel to the commission, which she has served on for the past 17 years, the past three as chairwoman. Commission member Don Tow said the resolution, which was forwarded to the Middletown Township Committee, stated that the Human Relations Commission believes Schwebel should be reappointed and wants a decision on the matter. The Township Committee failed to reappoint Schwebel, a well-known advocate for the disabled, to the commission for 2008, citing the fact that she is one of the plaintiffs in a legal action brought against the township for failure to comply with requirements of the Americans with Disabilities Act. The township maintains the lawsuit settlement is not finalized and precludes Schwebel's reappointment. In the resolution, the HRC also requested that the Township Committee fill all 11 seats and diversify the membership of the commission. According to the township'sWeb site, the commission is supposed to be comprised of 11 members. After their monthly meeting on Jan. 24, the HRC membership is down to six, with two members considering resigning, pending the township's response to the resolution. "We are supposed to have 11 members but yet we didn't receive any new ones this year," Towsaid lastweek. "Last yearwe had eight, the year beforewe had seven and now we are down to six." Also at the HRC meeting, the commission did not name a new chairperson, a move that Schwebel believes left open the spot for her future reappointment. Schwebel's attorney,Anthony Brady Jr., said last week that he notified a court mediator about the township's failure to reappoint his client to the Human Relations Commission. Brady previously represented Schwebel, a resident of the township's Leonardo section, in litigation brought by Advocates for Disabled Americans. Brady sent a letter Jan. 24 to Judge James Clyne who has been the mediator in the legal action against the township. The letter states, "Recently, the defendant retaliated againstMs. Schwebel in her First Amendment and LAD rights by not reappointing her to theMiddletownHuman Rights Commission on which she has served for 17 years, the last three as chairperson, which they admitted was done because of her filing this civil rights suit." He said the litigation was settled as of Aug. 1, 2007. Brady said that he would wait for a response from Clyne before deciding on any further action. "I don't know what we are going to do at this time," Brady said last week. "Once a discussion is had, then I will weigh my options." He said that when he learned what the township had done he was stunned. "I was shocked," Brady said. "Thiswhole thing is shocking. It's a complete violation of her FirstAmendment rights. This isNew Jersey in the United States, it's not like we live in Romania." Schwebel said she still had not heard news of a decision on her reinstatement to the HRC as of last Friday. She, along with others interested in the issue, attended the Jan. 22 Township Committee meeting looking for answers. But according to Township Attorney Bernard Reilly, answers were not something that Schwebelwould be receiving that night. "It is a personnelmatter," Reilly said. "It is not supposed to be discussed in a public meeting, so I recommend that any further discussion of this matter be held for an executive session." Earl Teasley, chairman of theMonmouth County Human Relations Commission (MCHRC), as well as other supporters of Schwebel, spoke on her behalf at the meeting. Reading from a letter he distributed, Teasley said he was there to support Schwebel, who is vice-chairwoman of the MCHRC. 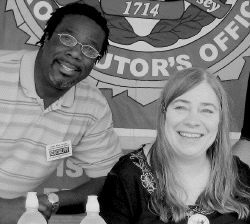 "As chairperson of the Monmouth County Human Relations Commission I am amazingly shocked and disconcerted that Commissioner Carolyn Schwebel has not yet been reappointed to the Middletown Human Rights Commission," Teasley said. "At the Jan. 6meeting, themayor stated that Commissioner Schwebel was not reappointed due to her 'litigation against the township that isn't settled. 'Although somewhat irrelevant, this litigation was indeed settled on Aug. 1, 2007." Teasley said that he was disturbed that anyone would find Schwebel's activities as an advocate troubling. "I am particularly distressed that it appears most clearly that Commissioner Schwebel's non-reappointment is retaliatory for her longstanding activities involving advocacy for access and compliancewith ADA guidelines," Teasley said. "As chair of the Monmouth County Human Relations Commission, formed by the Monmouth County Board of Chosen Freeholders in 1990 to combat the causes of bias and discrimination that result in acts of violence, vandalism and violations of civil rights, I am concerned about the actions and reasons that have surrounded Commissioner Schwebel's non-reappointment, as they ostensibly represent violations of Commissioner Schwebel's rights." Teasley lauded Schwebel's work as a human rights advocate. "As chair of the Middletown Human Rights Commission all of Commissioner Schwebel's actions and requests for information have been consistent with the Middletown Township resolution forming the HRC in 1968, the guidelines for the Middletown Township Human Rights Commission, and theMiddletown TownshipHuman Rights Commission bylaws," Teasley said. "The denial of access is truly a formof hate and bias, and those who bring access issues to our attention, to the forefront of our consciousness, should not be punished but applauded." Teasley said on Friday that the MCHRC will not seek any legal recourse on the matter but may forward their concerns to theNew JerseyHuman Relations Commission. Middletown resident PatriciaWalsh also came to the meeting to speak in support of Schwebel. "I am here to ask that you reconsider Carolyn and place her on the Human Relations Commission," Walsh said. "How can you say that the reason she was not reappointed was due to her being in litigation with the township when you reappointed her in 2006 after she filed her complaint?" Walsh said it is hard to explain why Schwebel wasn't reappointed when the litigation is cited as the reason. Walsh, a member of the Middletown Board of Education, said she found it odd that ongoing litigation was discussed at a public meeting in the first place. "I knowwithmy own experience that litigation being discussed is something that should not be going on in a public setting," Walsh said. "It is, in fact, discussion that should only take place in a closed executive session." After Reilly's statement Schwebel came up to the microphone with questions but was quickly interrupted by Reilly, who said that they could not discuss thematter in the public forum. But Schwebel decided to ask her questions anyway. "I know my matter was tabled for discussion from the last meeting," Schwebel said. "Is it off the table?Has there been any discussion?" Reilly said that no formal discussion had been held but it would have to be done in an executive session. Schwebel was not pleased with the response and wanted to know the opinions of the committee members, especially Mayor Gerard Scharfenberger, but Reilly would not allow a response. According to Reilly, all discussion by the Township Committee on the topic would be held until an executive session on the matter is held. Committeeman Patrick Short said that he could not respond since the matter was to be handled by Reilly, but he reiterated what had already been said on public record. "I can only say what has been part of the public record, that Imade amotion to reappoint Dr. Schwebel to the commission," Short said. "I was [as] surprised as she to have learned that she was not reappointed. I was also surprised that the mayor chose to use the term "we" as if the entire Township Committee board, had made the decision not to reappoint her when in fact, I knew I nor othermembers of the board had not been consulted in the…decision." Schwebel is a retired school psychologist who was one of the plaintiffs in a 2004 lawsuit that charged Middletown Township with not complying with provisions of the Americans with Disabilities Act. The lawsuit charged that the township has not provided adequate accessible parking spots or railings and other special devices for people with disabilities. According to both Reilly and Brady the lawsuit was settled onAug. 1, 2007, but the terms of the settlement have not been finalized. Schwebel is a member of The Equalizers, a local civil rights advocacy group that works to ensure that localmunicipalities include features thatmake facilitiesmore accessible for the disabled. Teasley said Friday the MCHRC will keep an eye on the issue of Schwebel's reappointment. "What has happened does leave me to think that the Monmouth County Human Relations Commission may need to direct some of its attention toward the diversity and equity issues inMiddletown Township," Teasley said.